Having got some new food presentation rings today, I was eager to try them out, so decided to create a tian, or layered, potato dish. Cut the pepper in half lengthways. Using a cook's torch, char the skin all over and immediately place the pepper halves in a sealed plastic bag. Leave until cool, by which time the skin should scrape off easily under running water. To make a good fit, place the pepper on the work top (it should be fairly pliable now that it is skinless) and using the presentation ring as a cutter, create a piece the same size as the ring. Cut the potato in very thin slices using a mandolin. Place the food presentation rings on an oven-proof baking sheet, and put a layer of potato slices in the bottom, then the pepper. 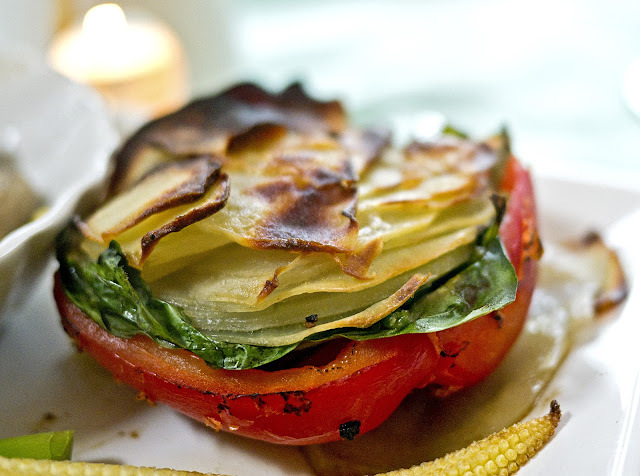 Add a layer of spinach leaves, then top with a layer of potato slices. Spray the top with Fry Light and bake at 220°C for 20-30 minutes until browned on top and cooked through. Place a tian on each plate, then remove the rings.